From Anagram Balloons, USA - the world’s largest manufacturer of foil balloons for every occasion! Anagram Decorator Foil Curves which will, in combination with an expanded range of sizes in Solid Color, revolutionise the way in which foil balloons are used in balloon decoration . These versatile balloons can be used in bouquets and bunches and to create arches columns, swags and elegant, whimsical sculptures. These new decorator shapes bring a rhythm and sense of movement to every project. 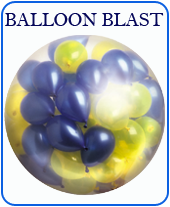 And, when connected together, you can fill space the spaces created between the balloons more quickly and more economically than latex! You can create an almost unlimited combination of shapes and styles when the Decorator shapes are connected together using a variety of simple techniques. The balloons have been specifically designed to pack together so that the internal curves of one balloon will fit around the external curves of another enabling the designer to create solid shapes as well as more open, stylish designs. These balloons are self sealing - which means you don’t need to knot them. Foil balloons do not expand like latex balloons and hence they burst if you overfill it. Foil balloons can also be air-filled or helium filled. Foil balloons must never be released outside as they do not bio-degrade and also they may conduct electricity. Do not expose foil balloons to extreme heat or they can burst. Size : 19". Inflated size 7" x 19" .